I was a theater kid. I started practicing yoga when I was twenty-two so before that I was in college, majoring in theater, acting, singing, doing some behind the scenes work too. I wasn't a born solo performer, it was more that I loved the ensemble work, the putting together of pieces that would move people: it was magic to me. I had never been good at team sports or gym class and had just assumed that I wasn't very athletic. Because I wasn't going to win anything, I basically looked at any kind of exercise as solely a way of losing weight; it wasn't enjoyable, it was just a means to an end. It's ridiculous how much time and effort I put into this idea that I needed to lose weight. When I took my first yoga class it sort of dawned on me that I could enjoy physical movement even if I wasn't "good" at it, and that felt so revolutionary. I had recently started a work-study gig at a yoga studio (Moksha Yoga Center in Chicago), and I was taking a bunch of different classes there; I had for a few years done only Bikram yoga, so this was a really nice period of exploration, to see what else was out there. 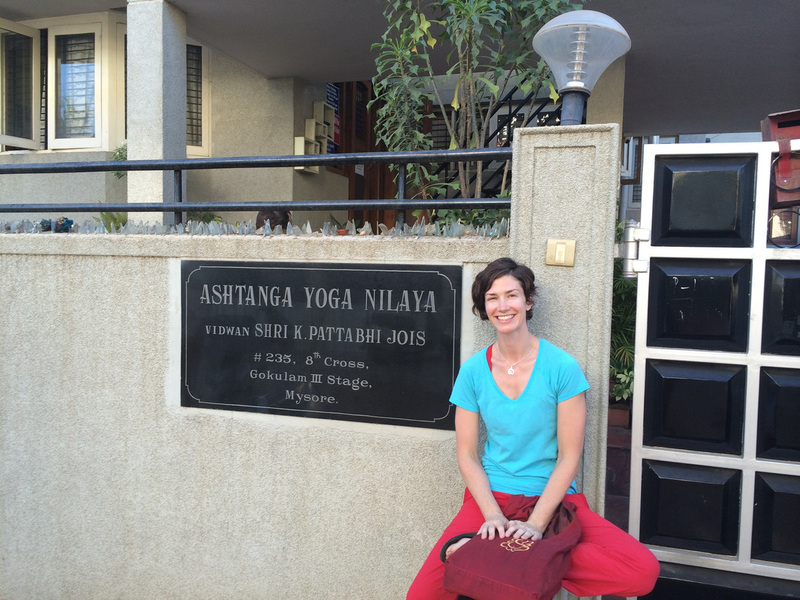 I kept coming back to the Ashtanga classes. I had no idea what Ashtanga was and I was sort of annoyed by all the repetitive forward folding but still, I kept coming back. It left me feeling really balanced when it was over. And I will admit that one of the reasons I liked it was that there was zero chance of having to do a handstand, which terrified me. Sort of funny in retrospect because this practice plays with fear in so many ways, and eventually I did have to face that one (as well as many others). After a while, I was exclusively taking led primary series classes. I knew about the Mysore class, but I thought it was for the advanced students-- why does everyone think that?-- and that I wasn't ready for it yet. But for a couple of months, my teacher Michelle kept telling me to go, go, go, it'll be fine, go. And when I got over myself and went, oh man, I walked into that room and something was different about it. The quiet. The breathing. It was all over. This was it. This was a few weeks before I left town for five months to do a children's theater tour, but I was so hooked I made self-practice work on the road. 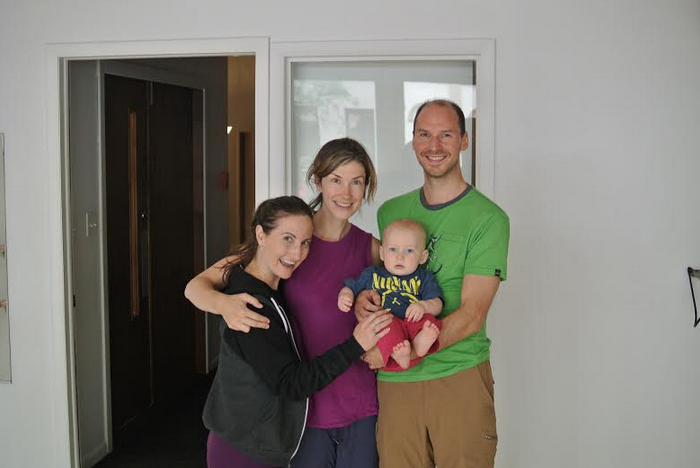 I found a Mysore program in Boston to do for two weeks while we rehearsed, and then once we got on the road (eight people, a van, and a truck, through twenty-two states), I practiced by hotel pools, in tiny exercise rooms between treadmills, and sometimes backstage. It felt really important, like I didn't want to waste any more time not doing the practice. What was so unique about the breathing in Mysore style that resonated with you? The sound of a couple dozen people breathing is such a soothing white noise, I remember thinking it was like being underwater. Quiet and loud at the same time. There is little verbal instruction in a Mysore class, so you're given space to get intimate with your breath and your body in a way that I just don't think is possible when someone is leading you through a sequence. Even now, when I’m teaching, listening to a roomful of breath is one of my favorite things. There’s that moment of silence after we chant the opening invocation, and then a rush of breath: so beautiful. Did you eventually encounter obstacles that tested your faith and zeal for practice? Early on, it was tested anytime something was hard. I had a hamstring injury my first or second year of practice, that was very frustrating because it took a long time to heal. Sometimes it felt like it would be easier to give up. New relationships were also a little bit of a challenge in terms of getting up early to practice. I would bargain with myself, practice on a moon day and sleep in another day instead. And there was a month in 2009-- I was in the process of moving from Chicago to San Francisco and my partner and I took a month-long trip to eastern Europe-- I went with good intentions but made it onto the mat only a handful of times. When we arrived in San Francisco and started practicing with Magnolia-- she got me back on track. Even before the trip, all the allowances I had been giving myself-- sleeping in one day and practicing on the moon day, not taking ladies' holiday off but then taking two days off some other time because I felt like I needed it-- sure, I was making it on to the mat five times a week but it felt cluttered, haphazard. Too much thinking. Magnolia knows how to cut through BS and she said "Either you're a daily practitioner or you're not." That really resonated with me. One of my college acting teachers once told me I was lazy, and that stuck in my mind; starting practice with Magnolia seemed, then, to be offering me a choice between being lazy, or being a daily practitioner. I chose the latter. And when you do things the prescribed way, taking off moon days and ladies holiday (which I had previously scoffed at, but Magnolia described it in a way that made sense to me, so I agreed to try it), both the practice days and the days of rest become all the more precious. You don’t have to push so hard; things progress a little more naturally. To be clear, I really don’t have any judgment about people who practice less than daily. I think any amount is beneficial, and it’s simply a matter of how much practice your life will allow and how far you want to go down the rabbit hole. I wanted to go all the way, so this idea that less than a daily practice was lazy was specific to my situation. The other thing that has sort of solidified my love for the practice is that it has helped me tremendously through some really hard times. My mom passed away in 2009 (that was a big year of upheaval for me) and I found solace in the practice. It was very hard for me to talk about at the time-- there was a lot of processing I had to do. I'm not really sure how to explain why it helped, breathing and stretching on a piece of rubber for a couple hours a day, but it did. You can go into this place where you just indulge the sadness: cry, scream into a pillow, get yourself worked up and that can be cathartic too. But in practice, you're continually asking yourself to feel whatever it is you're feeling, and then move on. It's a practice of non-dwelling (ideally, of course-- we all dwell sometimes). Oh look at that, I'm sad or frustrated or angry or whatever-- how interesting. Five breaths, then on to the next. It really helped me to get out of my head a bit. So as time goes on and I see the impact that practice has had on my life-- it's quite easy to be dedicated to it. When did you feel the pull to visit Mysore? Can you please share your experience visiting KPJAYI for the first time? I felt the pull early on in my practice, 2005 or 2006 when I heard my teachers talking about Mysore; it seemed so magical. But I was afraid, and thought I wasn't ready. Like, that's for the advanced students. And I had never been to that part of the world or taken such a long trip by myself. I try not to have regrets, but I do feel sad that I didn't follow my gut and just go; I never was able to meet Guruji. I finally made up my mind to go when I was in San Francisco practicing with and assisting Magnolia. The plan was that I would teach for her while she went to Mysore in January, and after she came back, in February, I would go. But even then, a couple of months away from my trip, when I had been accepted by the shala but hadn't yet gotten my plane ticket, doubt crept in. Maybe now wasn't the right time, maybe I couldn't really afford the trip. I remember telling Magnolia that I was thinking of going the following fall instead. Her response? If I didn't go to India in February as planned, I wasn't allowed to assist her or sub for her, effective immediately. I think she knew I was just scared, and needed a kick in the pants. Kinda like learning how to drop back: sometimes you just have to do it. So I did, of course. Magical is actually a good way of describing the experience. Time is a little different there, practice is different, your relationship to people back at home is different. I had heard enough stories not to be thrown by the power outages, the driving, the extra steps needed to do a simple task like mail a package-- these were all sort of fun parts of the experience. I was practicing with Saraswathi-- she was teaching in the main shala after the last batch of Sharath’s students, so I was starting practice around 9:30 when I first got there. I was into intermediate series at home, but since it was my first trip I was only doing primary for most of my time in the shala. So my practice felt light, easy, short. What I didn’t expect was how drastically the trip would change my life. I grew up in Minnesota and when I left for college I basically vowed that I would never live there again. The winters were horrible and lasted most of the year, and I just thought I belonged on one of the coasts. So it surprised me, to say the least, when a few weeks into my trip, I started having thoughts about moving back. In retrospect it makes a lot of sense: my mom was gone so my dad was living by himself, my sister and her kids were there, and having several jobs as I needed to barely make do in San Francisco, I wasn’t able to visit more than once or twice a year. But I just never expected that “maybe I should move to Minnesota” was a thought I would ever have. It felt like it had been placed there. I decided to table it until I got back to San Francisco; but within two months of my return I moved. Funny that every trip I’ve taken there has been followed by a big life event: after my second trip I got engaged, and after my third trip I got pregnant. What exactly is the asana practice to you? Is it a spiritual practice? It is a spiritual practice, yes. But it took me a while to come to that conclusion for myself, because I think the word “spirituality” is thrown around a lot and I didn’t know what it really meant. At first the practice just made my life better, and that was enough. What is God, what is spirituality, those are bigger questions that no one really knows the answer to, so I’m figuring it out as I go. I’ve come to believe that God is in the energy, the connections between people, or between us and the world. In every major religion there is this basic kernel of teaching, this “do unto others” mindset. So everyone really understands, whether that understanding is buried or not, that in order to be connected to God we must acknowledge a connection to each other. When it’s really quiet you can feel that connection. And when you go deep into practice there’s a clearing out of all the noise, all the stuff sitting on top of that quiet. You’re able to hear more clearly. It’s like a bird singing at a construction site-- there’s no way you’d hear the song unless you’re able to shut off the machines for a minute. Yoga helps you do that. 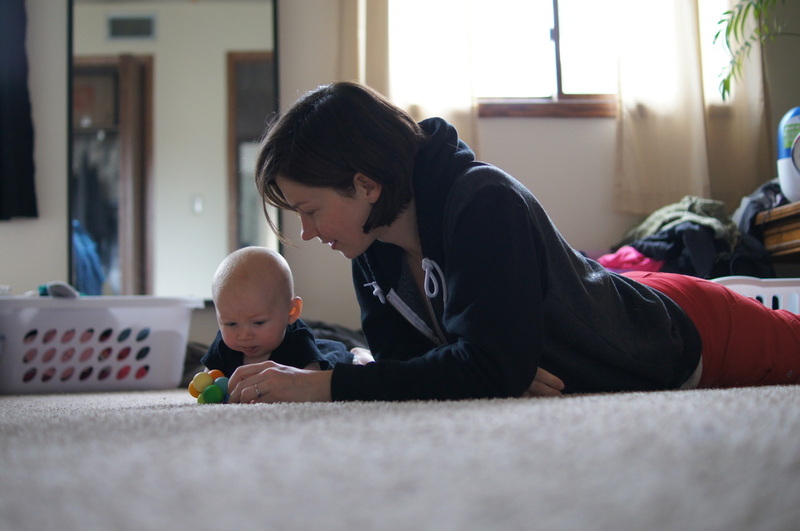 How has the practice prepared you for motherhood? Nothing prepares you for motherhood. But there are definitely lessons that I’ve learned, or am constantly learning, that have been helpful during my first year of being a mom. I think one of the greatest benefits of Ashtanga is that practicing for a long time means getting really intimate with your habitual patterns. What do I do when I’m stressed out, what does my body feel like, how do I breathe. Where do I physically locate fear in my body, or love, or uncertainty. Having this information has helped me be really clear about what’s happening in a difficult moment, so I don’t go all the way down the spiral. Those first few months really test you. And yoga practice isn’t a magic pill for anything, not even crying on the nursery floor (true story). But having had the experience of observing emotion come and go during practice makes it a little easier to understand that it comes and goes in real life too. My practice was also monumentally important during labor. I didn’t have to think about what technique to use (my midwives thought for a while I was Hypnobirthing, but I wasn’t), the breath and the focus came automatically, naturally, when it needed to. I am incredibly fortunate that my delivery went as I had hoped-- absolutely luck plays a role-- but I do think that in my particular case, the fact that I felt no fear, that I was able to trust my body and surrender to the experience, was a direct result of my Ashtanga practice. We play with fear, with discomfort, with trust, in small ways every day so that we know what to do when we’re faced with a bigger challenge. Ellie, can you share how influential your teachers have been on your practice and teaching? My practice and teaching don’t exist without my teachers. That’s not hyperbole; the lineage, the transmission of knowledge is central to what I understand as the practice of Ashtanga. Without guidance along the path it would be an entirely different thing. I’m not just referring to how you learn how to bind in such-and-such a pose, although it’s wonderful to have a teacher for those reasons too. But the bigger lessons I’ve learned from my teachers: how to build trust. How to surrender to the process. 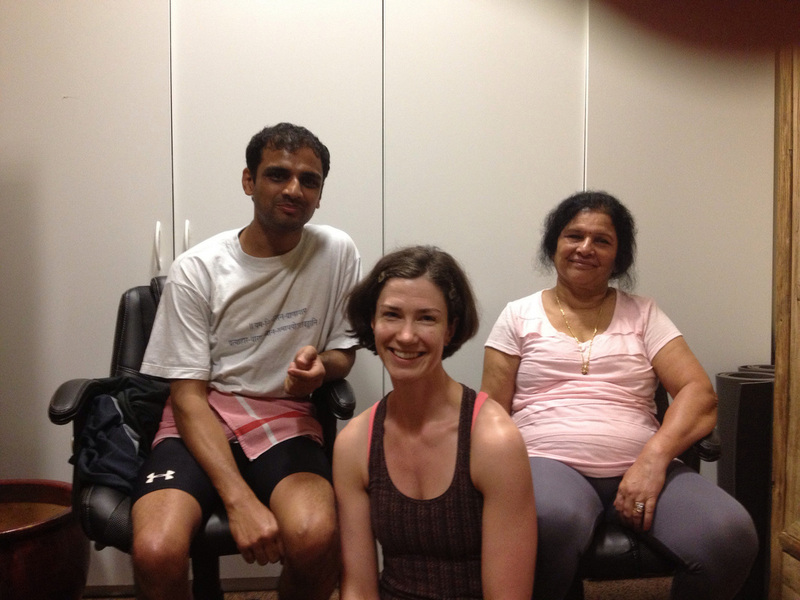 My teachers are the reason I went to India in the first place, and the reason I waited to teach a Mysore program until I had been given authorization. I think the biggest overall lesson I’ve gotten is the importance of practicing what you preach. It seems sort of obvious, but if you do not have a daily practice, you cannot teach others how to do so. Every Mysore teacher I’ve had, they’ve been there in the room practicing every day before everyone gets there. It’s inspiring to see that! Having had that experience as a student makes it that much easier to get on the mat every morning. Final thoughts you’d like to share? 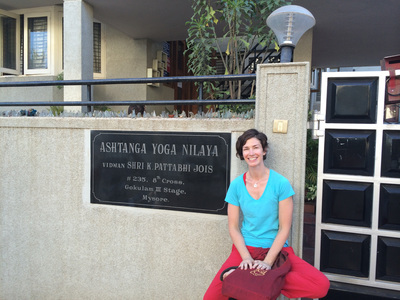 One of the most beautiful things about Ashtanga is the global community of people who practice. We may have completely different lives, different families and jobs and countries and speak different languages, but when Ashtangis meet they understand each other. I’m so grateful to have access to that community. Thank you for doing this project! I really enjoy reading other people’s stories.